Halocur is the only licensed product for treating and preventing Cryptosporidia infection in calves. It is a liquid to be given by mouth and comes with a suitable bottle and nozzle. A written veterinary prescription is required to buy this product. 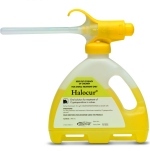 Halocur is probably the best treatment for this form of calf scour, and can be used on farms where Cryptosporidiosis has been found to be present. A pale yellow solution for oral administration containing 0.5 mg/ml halofuginone lactate in aqueous excipients (Benzoic acid (E 210) and Tartrazine (E 102)). - Prevention of diarrhoea due to diagnosed Cryptosporidium parvum, in farms with history of cryptosporidiosis. Administration should start in the first 24 to 48 hours of age. - Reduction of diarrhoea due to diagnosed Cryptosporidium parvum. Administration should start within 24 hours after the onset of diarrhoea. In both cases, the reduction of oocysts excretion has been demonstrated. For oral use in calves after feeding. - Calves 35 kg up to 45 kg: 8 ml of Halocur once a day during 7 consecutive days. - Calves 45 kg up to 60 kg: 12 ml of Halocur once a day during 7 consecutive days. For smaller or higher weights, a precise calculation should be performed (2 ml/10 kg). To ensure a correct dosage, the use of either a syringe or any appropriate device for oral administration is necessary. The consecutive treatment should be done at the same time each day. Once a first calf has been treated, all the forthcoming new-born calves must be systematically treated as long as the risk for diarrhoea due to C. parvum persists. Do not use on an empty stomach. Do not use in cases of diarrhoea, which have been established for more than 24 hours and in weak animals. For treatment of anorexic calves, the product should be administered in half a litre of an electrolyte solution. Animals should receive adequate colostrum according to good breeding practice. Overdose: As symptoms of toxicity may occur at 2 times the therapeutic dose, it is necessary to adhere strictly to the recommended dosage. Symptoms of toxicity include diarrhoea, visible blood in faeces, decline in milk consumption, dehydration, apathy and prostration. Should clinical signs of overdosing occur the treatment must be stopped immediately and the animal fed unmedicated milk or milk replacer. Rehydration may be necessary. Repetitive contact with the product may lead to skin allergies. Avoid skin and eye contact with the product. In case of skin and eye contact wash thoroughly the exposed area with clean water. If eye irritation persists, seek medical advice. Wear protective gloves while handling the product. Wash hands after use. Halocur should not enter watercourses, as this may be dangerous for fish and other aquatic organisms. Any unused veterinary medicinal product or waste materials derived from such veterinary medicinal product should be disposed of in accordance with the local requirements. 500ml high-density polyethylene bottle containing 490 ml of the oral solution. Below are some recent questions we've received regarding Halocur, including answers from our team. Hello. I need to order this prescription into the United States. Please confirm that you wouldste accept a prescription from veterinary medicine here. I would also need the link to the prescription template. We can accept a prescription from your own vet. This can be written on our template (http://www.viovet.co.uk/Viovet_prescription.pdf) or your vet's normal prescription form. You do however need to ensure that your local customs authorities are happy for you to import medicine from abroad. They usually are and we do send medication to the USA but it is down to you to deal with the formalities connected with importation. When you place your order you can request that we include a copy of the written prescription with the order. This is normally sufficient if we send by Royal Mail. If you choose UPS then we will do this for you automatically anyway, but UPS is more expensive.